If you are the beginner of WinAVI but have not known about How to trim video clips with WinAVI, this tutorial will gives you more helps for doing video trim. 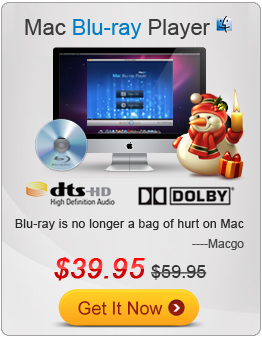 Sometimes you might want to only have the funny clips video to save but do not want to convert the whole movie and make playback on other device. If so, you should know about how to trim video clips. 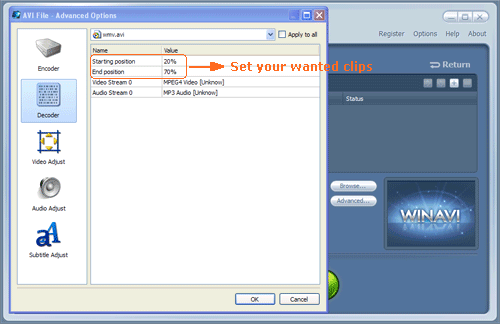 Here we take WinAVI All In One Converter as an example to guide you on how to trim video clips step by step.Because this program not only supports add subtitle, merge video, split video,create DVD chapter menu, but also provides you an option to trim video clips when you do video conversion. Please follow these steps as below. 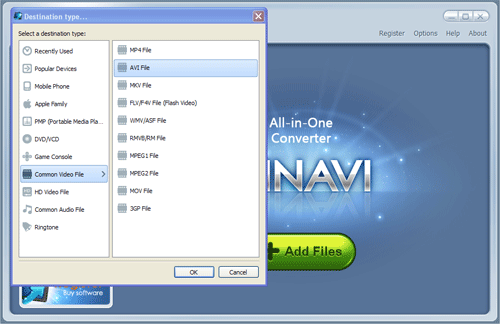 Step 1: Free download WinAVI All In One Converter, the install and run it. Step 2: Load video file. 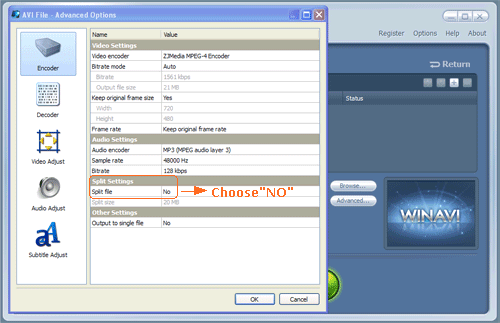 You can click"Add Files" to input video file or drag the selected file into program directly. Then choose output format. Here we choose "AVI" as an example. Step3: Click"Advanced" option and then the program will pop up a new window and automatically switch to a "Encoder" menu interface. Please choose "NO" on "Split file" option. Step 4: Click "Decoder" menu on the left column and then set the starting position and end position on the right column to trim video clips from the whole movie. Step 5: When all are ready, please click "Start" button to convert. Then you can click"Open output directory" after all work has been done. And if you can see the trimmed video as this result, that means you have learnt how to trim video clips with WinAVI All In One Converter.